November is always an exciting time: The year is about to end, Thanksgiving is around the corner and the weather cools down. But November is also the time of the year when all eyes are on diabetes. World Diabetes Day (WDD) was created in 1991 by the International Diabetes Federation (IDF) and the World Health Organization (WHO) in response to growing concerns about the escalating health threat posed by diabetes. It became an official United Nations Day in 2006 with the passage of United Nation Resolution 61/225. It is marked every year on November 14th, the birthday of Sir Frederick Banting, who co-discovered insulin along with Charles Best in 1922. WDD is the world’s largest diabetes awareness campaign having a global reach of over 1 billion people in more than 160 countries. The campaign draws attention to issues import to the diabetes world and keeps diabetes firmly in the public and political spotlight. The campaign is represented by a blue circle logo that was adopted in 2007. The blue circle is the global symbol for diabetes awareness. It signifies the unity of the global diabetes community in response to the diabetes epidemic. 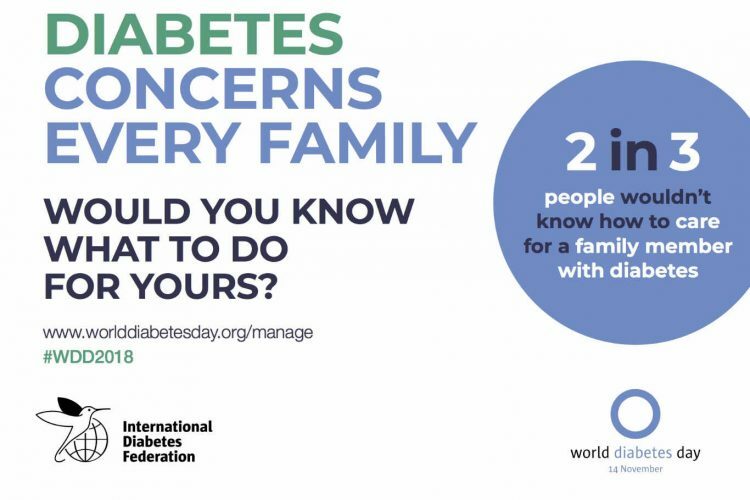 Promote the role of the family in the management, care, prevention, and education of diabetes. Since the inception of WDD, the blue sky circle logo has served as a backdrop for lots of activities, inspired the lighting of thousands of buildings worldwide, and helped raise diabetes awareness. 2.) If public speaking is not your thing, write about it on your social media accounts — the key thing is to tell people in your community about diabetes. Tell them why it is important for them to know about diabetes and describe to them the symptoms of type 1 and type 2 and diabetes. 3) Dress up in blue: make sure to have a blue t-shirt and a pair of jeans clean to wear that morning. Walk your dog in them. Do your groceries in them. And while you are at it, make sure to tell everyone that Nov. 14 is World Diabetes Day. 4) Join a diabetes online community: there are so many good reasons to connect with others touched by diabetes online. So, if you have been postponing it, World Diabetes Day is a great time to come out of the “diabetes closet,” sign up to a diabetes community to learn from others and share the experience of your life with diabetes. 5) Participate in The Big Blue Test: at 2 pm, local time (wherever you live) hop on your favorite diabetes online community and take the Big Blue Test. Thousands of people with diabetes will test their blood sugar, do 14 minutes of exercise, test again and share their results online. 6) Organize a family-themed physical activity such as a hike, or play flag football or soccer. 7) Arrange an activity at your workplace. 8) Organize a diabetes walk and register it with the World Diabetes Foundation. 9) Light up a monument, local building, or even your house in blue. 10) Promote WDD on your social media accounts by sharing WDD resources. Take a selfie with the Blue Circle Selfie App available for iOS and Android phones and tablets. Simply take a selfie or a group picture, position the blue circle around the image and share it on social media (#WDD) with a personal message. You have no excuse. It’s not hard and we can make a big difference if each of us takes the time to raise diabetes awareness.